Hello today we are going to talk about event integration. 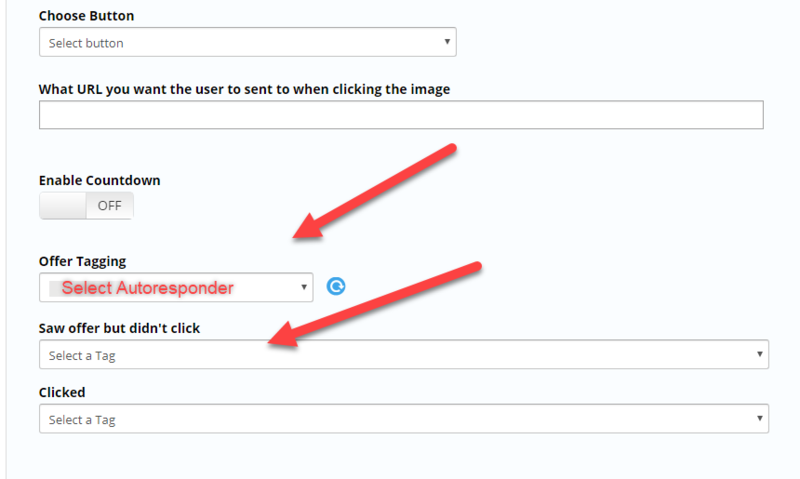 We're going to talk about integrating your auto responder into your event to where every registrants name and email will get captured by easy webinar for the event notifications, but easy webinar will also send that name and email data back to your auto responder. So you should already have your integration setup at this point in order to proceed with selecting your integration. If not take a look inside your My Account tab > Integrations you have a large choice to connect through an API and there is specific training for each that will help you sync up your specified auto responder. This specific training what we're going to concentrate on is once you have your integration done where do you make the connection for each event. 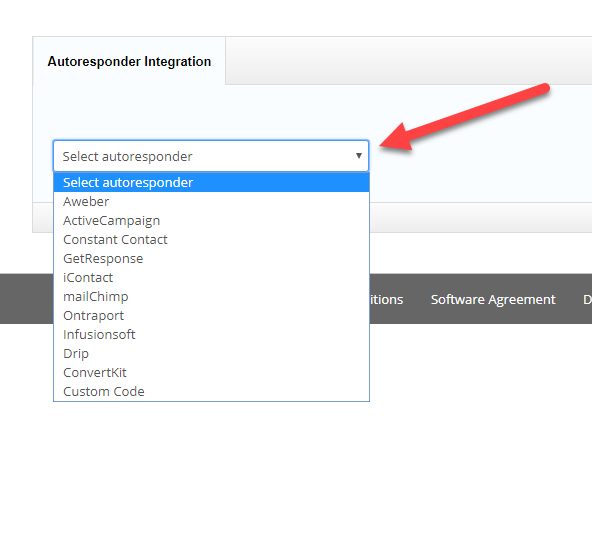 When you create your event and you get to the event integration tab you can select from this drop-down your specified autoresponder. as you can see here's the list of those same integrations and when you have a connection to it you just simply select whichever one it may be then the specified list that you may want to add those names and emails to. The list already has to be pre created inside your autoresponder before it can be found here and if it's not and you want to open up a new tab and create it all you need to do is click on reload list and tags and then it will be found. Some auto responders like activecampaign, getresponse, ontraport, infusionsoft, drip and convertkit offer tagging abilities tagging abilities like: applying the tag for everybody who registered, everybody who came to the webinar, those that watched it full, did not come, left early, watch to replay, or even asked a question. 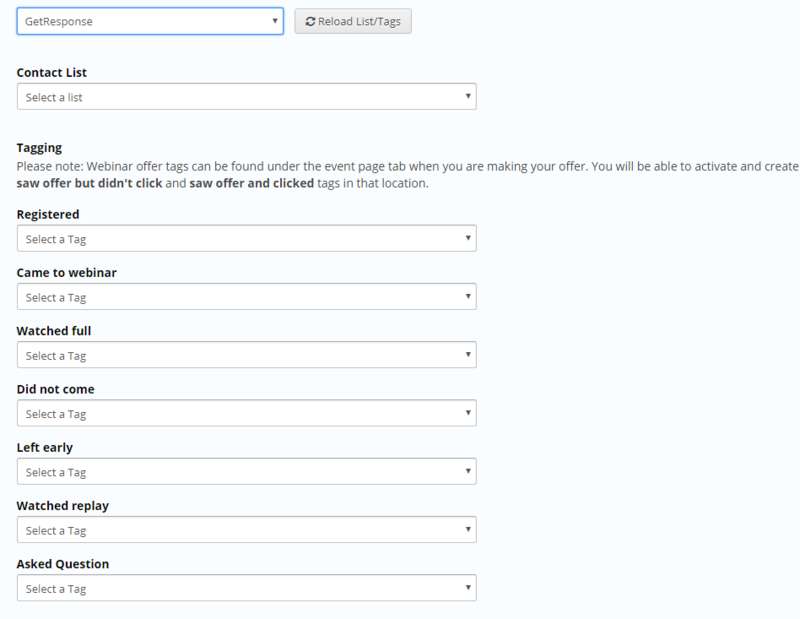 You can also have tagging within your offers and on your event page when you create an offer you can scroll down and also select that same autoresponder and then have a tag that's already pre created in your system for saw the offer but did not click and saw the offer clicked on it. Registered Tag, It is applied when attendee register for the event. Came To Webinar Tag, it is applied when attendee come to event. Watched Full Tag, It is applied when attendee watched the event till end. when attendee came late and watch till end and its percentage is more than equal to 85% this tag is also applied. Did Not Come Tag, It is applied when attendee do not come to the event. Left Early Tag, It is applied when attendee come to event at the beginning of event and left before end of the event and percentage watched is less than 85%. Watched Replay Tag, It is applied when attendee watched the replay. Asked Question Tag, It is applied when attendee asked question. For this question box is enabled for the event or in the replay. Saw Offer But Did Not Clicked Tag, It is applied if offer is enabled and displayed in the event when attendee is present in the event but did not click it. Clicked Tag, It is applied when attendee click the offer.